Desert buildings, like we desert rats, need big hats. That's a philosophy most famously articulated by noted Tucson modernist architect Judith Chafee. 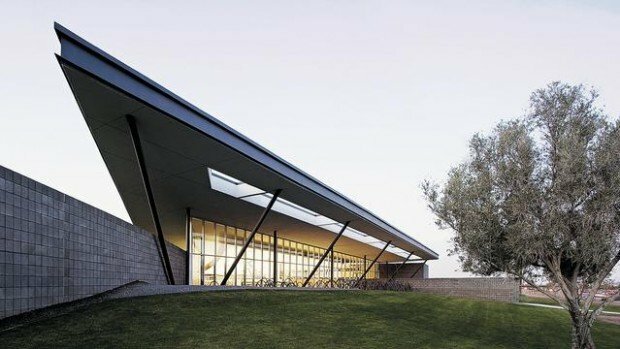 It is embraced by Les Wallach, whose Tucson firm, Line and Space Architects, was cited on Earth Day by the American Institute of Architects Committee on the Environment for designing one of the Top Ten Green Projects of 2008. Wallach was lead designer for the Cesar Chavez Library in the Laveen area of Phoenix. The building definitely has a big hat — a 37,000-square-foot roof that is nearly 50 percent larger than the library itself. The wide swath of shade cast by the roof allowed the design to accommodate window walls north and south, said Johnny Birkinbine, project architect. The building invites light but not heat. There are no windows on the west in deference to the searing setting sun. The east windows, including one that gives a view of a nearby lake, are totally shaded by the roof line. The building is also partially dug into the earth, providing additional insulation. All the water that falls on the vast expanse of roof will be funneled into the existing lake — now part of a Phoenix city park — and will totally offset the water used by the building's toilets. The 25,000-square-foot $5 million dollar building is a regional library for the southwest Phoenix regions of Laveen and South Mountain. It is twice the size of typical branches, Birkenbine said. In its first year of operation, it has become the third busiest in the 15-branch Phoenix library system. Other desert-friendly touches include a patio on the north side, where patrons can direct "spot diffusers" — air vents like those found on airplanes, which vent the library's cooling system. The air being expelled is about 85 degrees, which will feel cooling in midsummer, Birkinbine said. The building had previously won Line and Space a merit award from the Western Mountain Region Chapter of the American Institute of Architects. Winners of the 2008 Top Ten Green Projects selected by the American Institute of Architects Committee on the Environment. Buildings are in the architects' cities unless otherwise noted. • Aldo Leopold Legacy Center, Kubala Washatko Architects Inc., Cedarburg, Wis.
• Discovery Center at South Lake Union, Miller|Hull Partnership, Seattle. • Garthwaite Center for Science and Arts, Cambridge School of Weston, Architerra, Inc., Boston. • Lavin-Bernick Center, Tulane University, New Orleans, Vincent James Associates Architects, Minneapolis. • Macallen Building Condominiums, Burt Hill with Office dA, Boston. 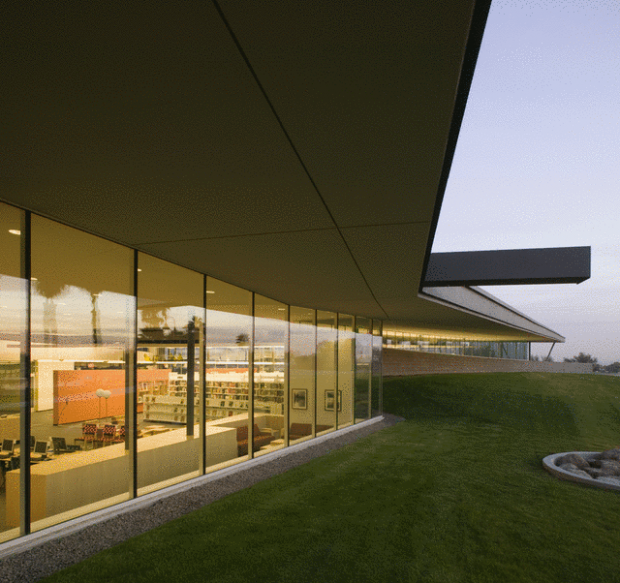 • Nueva School Hillside Learning Complex, Hillsborough, Calif., Leddy Maytum Stacy Architects, San Francisco. • Pocono Environmental Education Center, Dingman's Ferry, Pa., Bohlin Cywinski Jackson, Wilkes-Barre, Pa.
• Queens Botanical Garden Visitor & Administration Center, BKSK Architects, New York. • Yale University Sculpture Building and Gallery, KieranTimberlake Associates, LLP, Philadelphia. ● Contact reporter Tom Beal at 573-4158 or tbeal@azstarnet.com.